This guide was designed mainly to inform parents about attention deficit disorder with or without hyperactivity (ADD/ADHD). It contains information to help you understand ADD and ADHD, the causes, and the potential consequences of failing to provide optimal treatment for a child with either of these conditions. If you are the parent of a child with ADHD, know that you have a very important role to play in your child’s treatment. Your child needs structure and personalized support. Children with ADHD have a lot of ideas bouncing around in their heads and need help to focus them and give them direction. In some cases, children even need help slowing down their physical actions. This means you’ll need to develop skills to help your child reign in inappropriate actions and behaviours. 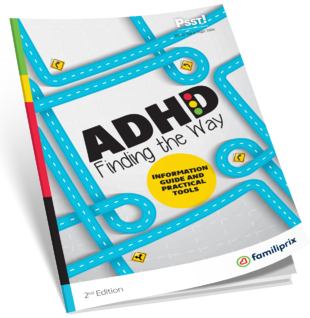 In this guide, you’ll find some tips and tools you can use at home to help your child modify their behaviour and learn to manage their ADHD. You can also team up with the professionals helping your child with their condition, particularly their teacher and various health professionals. They’ll be able to help you implement measures adapted to your child’s strengths and difficulties. Adults can also have ADHD, so this guide has a section just for them. How do I know of my child has ADHD? Y. Ferlatte Et P.Y. Hébert Pharmaciens Inc.